Just days before the election, Langelle will give an Artist’s Talk beginning at 7 p.m. at the Gallery on November 4th. The event runs from 6-9 p.m. Wine and hors d’oeuvres will be available. 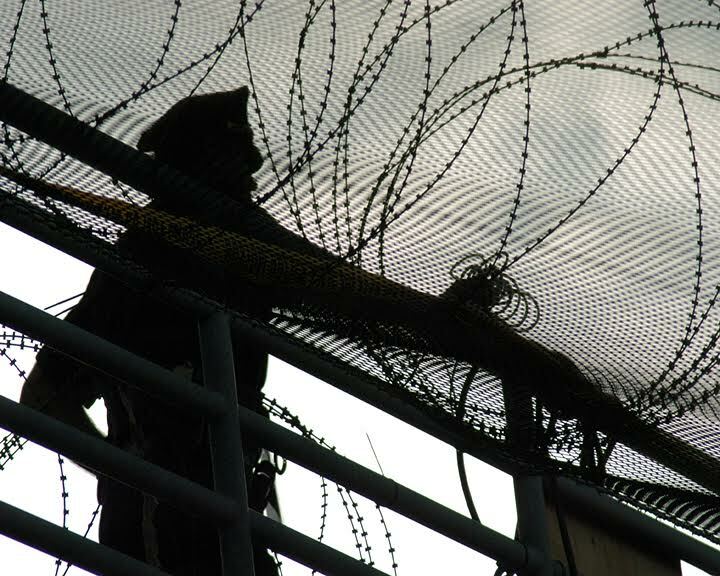 Policeman surrounded by razor wire high above on platform looking down at the so-called “Free Speech Zone,” re-dubbed by activists as the “protest pit” during the 2004 Democratic National Convention in Boston, MA. Buffalo, NY–The Opening Reception for If Voting Changed Things took place at the ¡Buen Vivir! Gallery for Contemporary Art in Buffalo’s Allentown on First Friday, October 7 from 6-9 p.m. The exhibit features historic photographs shot by photojournalist and Gallery Director Orin Langelle. Photographs from the 1972 Republican National Convention illustrate the resistance against the Nixon Administration’s war in Vietnam and the gap between a radical youth movement and the establishment. The Vietnam Veterans Against the War (VVAW) played a major role in the demonstrations. The photos from the Republican National Conventions in 2004 highlight the anger at the Bush Administration over the war in Iraq and the overall disempowerment for the many. Bush and company were using Ground Zero, the site of the September 11, 2001 NYC attack, to advance their pro-war agenda. The protests at the Democratic National Convention in 2004, not only showed the suppression of free speech, but demonstrated what activists called “the hypocrisy of the political process” by confronting the Democratic contender for president, John Kerry. Kerry, a Vietnam Veteran, was a high profile member of the anti-war movement in the 1970s, but his 2004 election platform included increasing the number of troops in Iraq. Langelle’s 1972 photos include many of these vets, including Kovic. “In the eleven elections since I shot those first photos in 1972, things have only gotten worse. Institutional racism is more ingrained–with Buffalo being one of the most segregated cities in the US. We are in a war without end, climate change is intensifying and injustice is rampant. Does voting change anything? This year’s election is particularly telling, as this may be the first election in US history where both candidates are so disliked by so many.” – Photojournalist and Gallery Director Orin Langelle. The exhibit was assembled to explore these themes as we approach the next Presidential election. Additionally, Langelle will give an artist’s talk at the gallery on First Friday, November. 4 at 7 p.m. – just days before the election. The exhibit’s closing reception takes place on First Friday, December. 2 from 6-9 p.m. The gallery is located at 148 Elmwood Avenue in Buffalo. Wine and hors d’oeuvres will be available at each event. Interviews and high-resolution photos available upon request.